The best of traditional folk & contemporary songwriting from Ireland, Scotland, Wales, and England– Celtic Eclectic: new releases & classics; broadcasting since 1979. When I play on my fiddle in Dooney, / Folk dance like a wave of the sea — W.B. Yeats, 1899. All over Ireland, Scotland, England and Wales / I can hear the mothers’ voices calling / “Children, children, come home children” — Van Morrison, 1982. Open app & then Click “Archives” icon at bottom of your phone’s screen and scroll to Music of the Isles for this week’s show. HD2 LISTENERS: Listen live to Music of the Isles, Thursday 7-9 pm, by clicking Listen Now Tab above & selecting WMNF HD2 New Sounds. Got Smart Speakers? More information on all the many ways to listen to WMNF HD2 New Sounds channel, including Music of the Isles, is here. Playlist indicates song & album title, artist, release date, country of origin, band member names, and sometimes songwriting credit. What’s Coming Up on MUSIC OF THE ISLES & WMNF? Explore EVENTS on WMNF Station Calendar. 4/18. Celtic music and more. This week we have an extended set of Nick Drake covers from the likes of The Unthanks, Ashley MacIsaac, and Solas. We also have a set with a wink and a nod to the English Royal Family. Keep Calm and Folksong On! 4/25. Our 20th Annual National Poetry Month Show. Listen to Celtic artists, such as Loreena McKennitt, The Waterboys, and Eleanor McEvoy, setting to music the poetry of Robert Burns, Alred, Lord Tennyson, W.B. Yeats, and more. 5/2. A show devoted to songs of the many tales surrounding King Arthur. Listen to Maddy Prior, Loreena McKennitt, Rick Wakeman, Alan Simon, Donovan, and many more add contemporary takes on Arthurian legends. 5/9. Music of the Isles 1988 Retrospective: Listen to a great year of Celtic Music & More with Van Morrison & The Chieftains, Dougie MacLean, Clannad, Capercaillie, De Dannan, Davy Spillane, Dolores Keane, The Boys of The Lough, Lennie Gallant, Silly Sisters, Richard Thompson, Jez Lowe, Mary Black, U2, The Waterboys, The Proclaimers, Billy Bragg, Hothouse Flowers, In Tua Nua, Enya, and more. All from the great year: 1988! 5/16. Great trad tunes and folksongs, as ever. One set will spotlight the early years of Steeleye Span. Later in the show two sets will highlight Celtic women artists covering Leonard Cohen songs. Listen to treatments by The Once, Pauline Scanlon, Susan McKeown, and others. 5/23. Another week of great music, including an extended set saluting the songwriting duo of Richard Thompson & Dave Swarbrick from their early Fairport Convention days. Listen to their songs from 1970 Fairport Convention albums, as well as contemporary cuts from Celtic artists covering their classics. BOOKMARK this page – – Don’t miss out on each week’s new show of traditional & contemporary folk! SEND A LINK FOR THIS SHOW TO A FRIEND— Introduce someone to the best of Celtic Music! To Support WMNF & Music of the Isles, use the Tip Jar above! We tip our hats to you for doing so, THANKS! Any contribution, big or small, is greatly appreciated. All work for airing this show is performed on a voluntary basis by its co-hosts, including purchasing music for broadcast at their own personal expense. These hosts have contributed their time, talents, and resources to keeping Celtic music alive for Greater Tampa Bay. They do so without compensation in any manner from any source. Any contribution you make to this show— every precious cent of it– fully & directly goes to support the best little radio station on the planet, WMNF. Please help fund Music of the Isles and aid WMNF Tampa Community Conscious Radio stay on air. IRISH MUSIC SESSIONS… for the “craic” & “ceol” (fun & music)– fair play to, ye! PUB PERFORMANCE– raise a pint to Tampa’s bards! 4/19. Nolan’s Pub, 230 Main St., Safety Harbor, 727-400-6998. 5/3&4. Molly Malone’s, 304 E. Davis Blvd., Tampa, 813-304-2777. TAMPA BAY CELTIC CONCERT VENUES — Check back again for further notification of Celtic artists on tour coming to Tampa Bay. CELTIC FOLK FESTIVALS– gathering of the clans & great craic at the feis! — Check back for local Celtic Festival updates. CLEARWATER COTTAGE CONCERTS, ClearwaterCottageConcerts@tampabay.rr.com, 3196 Wessex Way, Clearwater. Call (727) 712-0659 for info &/or RSVP. LAKESIDE HOUSE CONCERTS, Winter Haven. Call (863) 293-1510 for info. SOUTH TAMPA HOUSE CONCERTS, gshollowy@rmail.com. Call (813) 625-2688 for info. QUESTION: What can you find on our weekly Music of the Isles show? EXQUISITE vocals, lively jigs & reels, rowdy choruses, workers’ struggles, heroic accounts of poet rebels, humors of drinkers & scholars, their mirth, myth & magic, bawdy ballads, wicked fiddling & the pipes calling, Celtic mysticism, the draw of the land, its holiday customs and workaday life, dance tunes and harvest songs, but also the pull of the road and the sea, hornpipes & shanties, good times for both the prince and the pauper, hard times of men and women, emigration, haunting airs, love’s lament, harp strings & heartstrings, touching stories of tender emotions or the dark side of vengeful murder ballads, cautionary tales of roguish rakes, wild rovers, highwaymen, pirate outlaws, tributes to celebrated patriots, their noble cause, saluting the subsequent courageous burden of the common foot soldier, and, of course, marking in all manner the Celts on the march, immigration and new worlds, new sensibilities but with old stories to rekindle spirits, history alive– alive, alive-o! … a musical mirror to whom we are today, accompanied much by contemporary songwriting spotlighting that reflection. FOLKSONGS from England and the 7 Celtic Lands. Learn through music the history & culture of the Celtic nations: Ireland, Scotland, Wales, Isle of Man, Cornwall, Brittany, Galicia. Hear tradition alive & adapting in vibrant communities of the Celtic diaspora in America, Canada, Australia, New Zealand, and England. DIG THE FOLK ROOTS & climb all the branches of the Celtic Music genre. Taste the fruit of Folksong! Make it your tradition to listen to Music of the Isles, your site for Celtic Eclectic, ancient to modern! Since growing up in Cleveland (the Home of Rock and Roll) Bill Dudley has spent a lifetime in radio, beginning in his high school years, which coincided with the Great American Folk Scare. After starting out part time at a tiny little FM station in New Jersey, he became active in campus radio in upstate New York before moving to Florida in the 1960s. After working at a number of stations in the Tampa Bay Area, he was fired from his last commercial job (a country music station) just a few months after WMNF went on the air, which could be seen as some kind of omen. Started in late 1979 by station staffer Cameron Hendrix, the Music of the Isles Show was given to Bill in early 1980, along with a daytime Big Band and Swing program (later supplanted by the Live Music Showcase in 1996.) Along the way Bill founded the first Irish traditional band in Florida, the Wind That Shakes the Barley. Since the eighties he has made a living recording acoustic music albums for folks in Florida and other states, as well as producing radio documentaries for the Florida Humanities Council, and, more recently, promotional and documentary video. 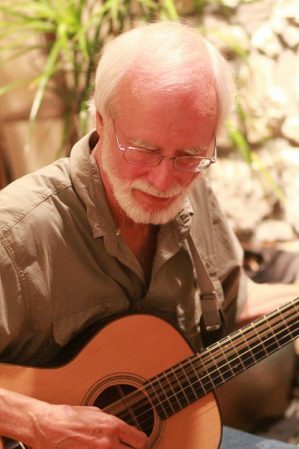 Bill also plays guitar in several Contra Dance bands, of which three have toured as far north as New England. An outdoorsy guy, Bill has a love of history, the old ways and traditions, and "hippie values." You can check out some of his work on the web at billdudley.com. Seán, born in NYC, holds dual U.S. & Irish passports. An educator for 30+ years, he has a keen interest in Balladry; its encapsulation of the human condition, its folk perspective, its timeless relevance. In his travels he's accumulated a vast library of traditional folk music from Ireland, Scotland, Wales, and England. Clancys to Pentangle, Planxty to Capercaillie, Pogues to Prodigals, Peatbog Faeries to Bellowhead, Imagined Village and beyond. Then back again. Music of the people by the people. Folk for, and of, folk concerns, not corporate fed fad. Folk people reflecting on the past, existing in the present, focused on the future. Folk for folk sake! It can be said of Seán stepping through life that “he takes most delight in the slip jigs & reels.” But when away from studio work, and not found grading papers from his day job of keeping our youth skilled in critical thinking, you can catch him at the local pub throwing darts. 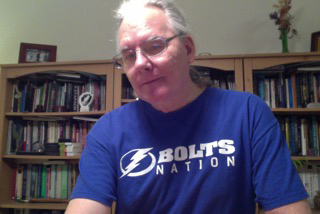 Or, perhaps, see him at his 2nd great passion: Tampa Bay Lightning hockey. Loyal to the team, he is a longtime, rabid season ticket member. Up the Celts (and Go Bolts)!